We all like to remember the key events in our lives and to mark the date on which they occurred. The most obvious being births marriages and deaths, or ‘hatches matches and dispatches’, as someone once put it. The anniversary of an event is a useful device for the writer, providing a cue for a flashback to some event that played an important role in creating the character of a protagonist and the motivation for his role in the unfolding plot. How often have we read, or written, sentences structured like that? How far do such tropes represent real life? 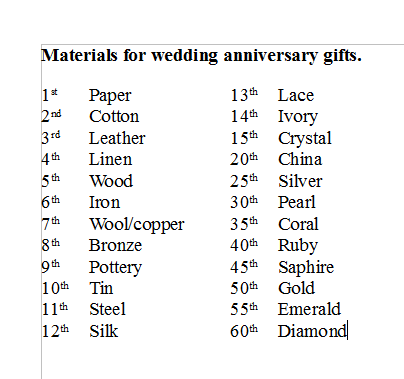 Wedding anniversaries are widely celebrated; there is even a long established list of materials appropriate for wedding anniversary gifts. Many people like to recognise the anniversary of the passing of a loved one with an ‘in memorium’ notice in a newspaper and/or the placing of flowers on the grave. Nations remember key moments in their history. July 4th., American independence day; 11th. November across the Western world, marking the armistice that ended the first world war. VE day and VJ day representing the two stages in the ending of World War II. For Ireland, 2016, and especially April, represents the centenary of the Easter Rising which accelerated the process towards independence. What about other things? The day you moved into your present home, for example? Your first day at college or work, the day you were dismissed or retired? And, for a writer, the day you were offered your first publishing contract. For me, April represents the month in which, five years ago, we moved into our present house. We had begun looking a year before, having decided that we wanted a bungalow with a bit more garden than we had with our previous property. We looked at several possibilities. Too many in our price range required the kind of improvement work that seemed daunting as I approached my 70th birthday, in itself, another important anniversary. We looked at a retirement village where the bungalows were well maintained but the interiors too small to accommodate the accumulated possessions of almost fifty years of marriage. Many of these possessions were reminders of other key events in our lives; silver and ruby wedding presents, souvenirs of memorable holidays; leaving gifts from work and from my days as an active member of a political organisation. Eventually we discovered a retirement village that had been abandoned when the Irish property market collapsed. The developer was trying to revive interest, and the properties were being offered at bargain prices. The show house was tastefully furnished but it, and thirty-odd identical bungalows, still looked smaller than our requirements. In one corner of the development, at the top of a hill, was a larger bungalow, on a bigger plot, that fronted the end of a cul-de-sac. To our amazement we were told the price of this unit was the same as all the others. We moved in on April 29th. Since then I have created an attractive and productive garden on the area of land surrounding it. This year will also see, in October, the tenth anniversary of my retirement and move to Ireland. But that’s another story! What important anniversary will you be celebrating in April or in any other month of 2016? By franklparker in General posts on April 1, 2016 . Looking forward to your posts. Happy blogging and all the best!!! Well, as T.S. Eliot said, “April is the cruelest month.” It’s the month I got word, in 2001, that my mother was dying. She was critically ill with COPD and osteoporosis, and the ups and downs of the months that followed were an emotional rollercoaster. It took her the better part of a year – and in the end, she died by her own hand. But that’s another story. Happier anniversaries – it will be our 32nd wedding anniversary, in June. We share our engagement day with the horrible, record breaking “Memorial Day Flood” of Tulsa, OK – which is where we lived when we met and got engaged. (Fortunately, our apartments were high and dry, but the damage in the city was devastating.) Nowadays, 32 years sounds like a terribly long time to be married to one person, but it has rushed by in the blink of an eye, and I can hardly imagine a life before he was part of it. I’m glad he didn’t decide I was just more trouble than I’m worth. Birthdays are always fun; never regret them or wish them away, because “another year older” is so much better than the alternative. Sorry to hear that April brings sad memories for you. As for 32 years being a long time married to the same person – I can beat that by 21 years! I hope you both make it that far. Thank you! That’s the plan! We’re looking forward to at least 70. “hatchs, matches and dispatches” I like that! The most important anniversary that I would be celebrating in April is my marriage. I am blessed to have love in my life and April is the reason why. Hello Frank, you are up and running, thanks for popping in at Barn & Beach and to my opening blog, I wont be on the allotment every day/letter but do pop by again! Hello frank, thanks for popping by my allotment, well you are up and running…ready for you ‘b’? I wont be on the allotment every day but do pop by again! April is Happy Birthday Month here, and it’s gleeful thoughts that Autumn must finally arrive and sweep away the heat.